Meet upon arrival at Kuching International Airport. 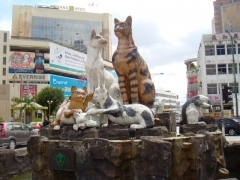 Then proceed for 3 hours Kuching City Tours. Experience the beauty of multi-racial community and see places of interest & the essential part of Kuching includes the building of the White Rajah, (Colonial Law Court, Clock Tower, Charles Brooke Memorial, Post Office, Square Tower), bustling Chinatown, Chinese temple. Discover the treasure of Sarawak museum, sightseeing to Astana, Malay Village & Kuching Water Front. After tour complete, transfer to hotel for check-in. Breakfast at the hotel, morning proceed to visit Sarawak Cultural Village. Popularly known as the ‘Living Museum’, the village is a showcase of a kaleidoscope of Sarawak’s cultures and traditions. On arrival, you will explore the 7 authentic replicas of the ethnic houses. Chinese Farm House, Malay’s Stilted House, Melanau Tall House, Penan Hut as well as Longhouse of Iban, Bidayuh and Orang Ulu. Displayed in each house are the many artifacts made by the individual dwellers. Demonstration of arts and crafts like beadwork, wood and bamboo cravings, “Pua” weaving and straw weaving can be seen while touring the village. You will also be entertained by the traditional dances of the various ethnic tribes of Sarawak at the village theatre. After lunch, proceed to visit Semenggoh Nature Reserve. Upon arrival at the reserve, you will be able to catch a glimpse of the Orang Utans during their feeding time. The guide will narrate to you the behavior, emotions and characteristics of the special primate called Orang Utan, meaning of ‘Man of the Forest’. Continue journey to visit Sarawak Pottery Factory. You will be fascinated by the delicate and creative work involves by the skillful artists. This is a chance for you to ghet a typical Sarawak ceramic and native handicraft or ‘must buy items’ to bring back as a souvenir or a gifts for friends, family members or personal collection. Kuching is a good destination to shop for souvenir such as woodcarvings, ‘Pua Kumbu’ with native design and pepper products as well. Sarawak’s bird nest factory and local products center are also one of the famous souvenirs which can be found in Kuching. After dinner, transfer back to hotel for overnight. Breakfast at the hotel and free at leisure until time for transfer to Kuching International Airport for your departure flight.